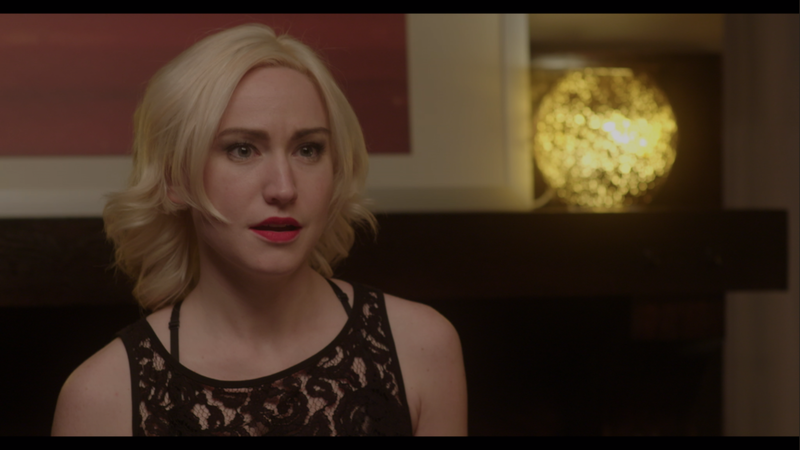 During a gathering of estranged family and friends, Jolie Wright is forced to confront her fractured relationship with her brother. 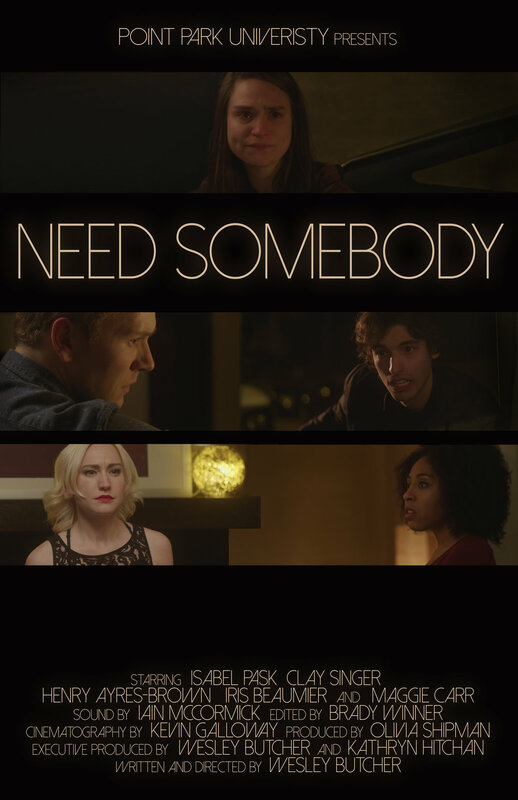 Need Somebody, tells the story of Jolie, young women spiraling out of control after the recent death of her girlfriend, Callie. In attempts to gain closure, Jolie’s estranged older brother Weston signs Jolie out of treatment to attend her girlfriend's funeral. Just missing the funeral, Jolie and Weston stop at the home of Callie's sister Liza. The duo joins their childhood best friend Jack and his irreverent girlfriend, Shaina. Expecting a night of rest, the exact opposite greets Jolie in the form of Liza. After a confrontation between the two women, Jolie retreats to an upstairs bedroom. Shaina follows attempting to comfort her. Meanwhile, Jack and Weston have their bit of catching up in the downstairs living room. We eventually return to the upstairs bedroom with Shaina and Jolie. The tension increases when Shaina begins to make an open pass at Jolie. Jolie retaliates by pinning Shaina against a wall. The exchange eventually breaks up when Jack enters the room. Frustrated, Jolie storms out of the room and into the dining room. Things then reach an actual boiling point when Jolie finally addresses the reasons they are all joined in the first place. Unable to handle it all, Jolie then storms out in a fit of rage. Weston follows while the remaining group is left to question what transpired between them. 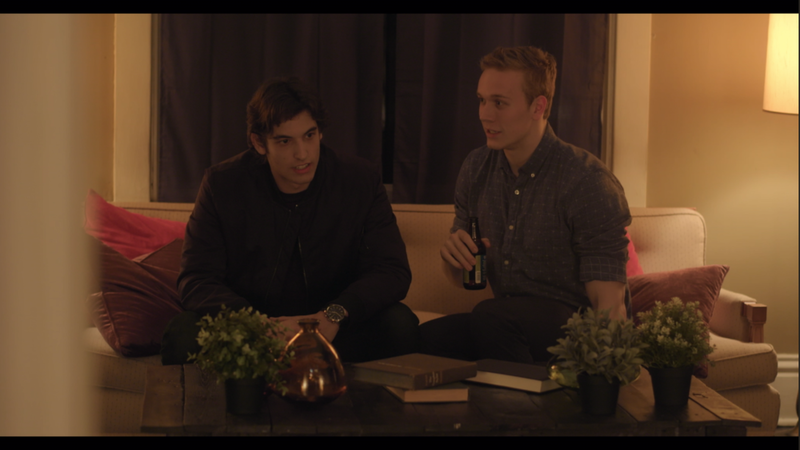 The siblings then share an intimate exchange about their fractured relationship and its tectonic effect on the events that have already occurred. Wesley Butcher hails from the small town of Parkersburg, West Virginia and currently resides in Pittsburgh, PA. He will be receiving his B.A. in Cinema Production from Point Park University this coming Spring. Concentrating in directing with a passion for writing, Wesley has used his theater acting experience and love of great indie film to feed his storytelling. He has gained great acclaim from his peers and professors as a natural talent with an inspired and distinct voice in his writing and direction. He is known for his strong representation of female characters on screen. Wesley’s films “Madison/Martha,” “Sadie & Delilah,” and “Between Pages” have all been featured in Point Park University’s annual showcases and have received impressive reviews. He is proud and excited to premiere his thesis film, “Need Somebody” and looks forward to his career in filmmaking post-graduation. Brady Winner was born and raised in Williamsport, PA and has received his BA in Cinema Production from Point Park University. Since high school, Brady has had a passion for telling stories through film. More specifically, telling stories through the art of film editing. Brady has always loved being the invisible artist, the craftsman deciding what you see and when you see it. Brady has edited various short films including his most recent work, Need Somebody, a senior thesis directed by Wesley Butcher. Along with short films, Brady has recently begun creating wedding films for couples looking to document and preserve their big day - a path he plans to continue down in the coming months. A Pittsburgh Native, Kathryn Hitchan covers everything from narrative, commercial, and documentary filmmaking. Hitchan also strives to make compelling musical performance and concept videos. Her passion for the art of filmmaking is evident in all the work that she produces. Kathryn received her B.A. in Cinema Production and Digital Arts from Point Park University in the Spring of 2016. Since graduating she has worked with studios in the Pittsburgh area such as Animal VFX, Uppercut Studios, and Maverick Visuals, as well as countless independent award winning projects. Kathryn premiered her senior thesis, "Altered" last spring, and is preparing for the premiere of “Need Somebody,” for which she executive produced and did production design. Olivia Shipman hails from Rochester, New York and received her BA in Cinema Production from Point Park University in Pittsburgh. While in the Steel City Ms. Shipman produced many successful student films, including the award winning comedy “Soup or Salad” directed by Mina Hoffman, and “Need Somebody” directed by Wesley Butcher. She also has garnered acclaim as a makeup artist for film and photography. Most recent projects have included creating video content for the Carnegie Museum of Art, and collaborations with Pittsburgh based photographer Tony Moux. Olivia is currently producing a music video for up-and- coming band “Chase and the Barons,” and a PSA for the “It’s On Us” campaign to bring attention to sexual assault on college campuses. Born and raised in Philadelphia, PA, Kevin Galloway now lives and studies in Pittsburgh, PA. Kevin is a senior cinema production major at Point Park University concentrating in cinematography. He has spent the entirety of his college career working on short films, both student based and professional. Kevin is known for his realistic lighting style and his ability to evoke emotion through the camera lens. 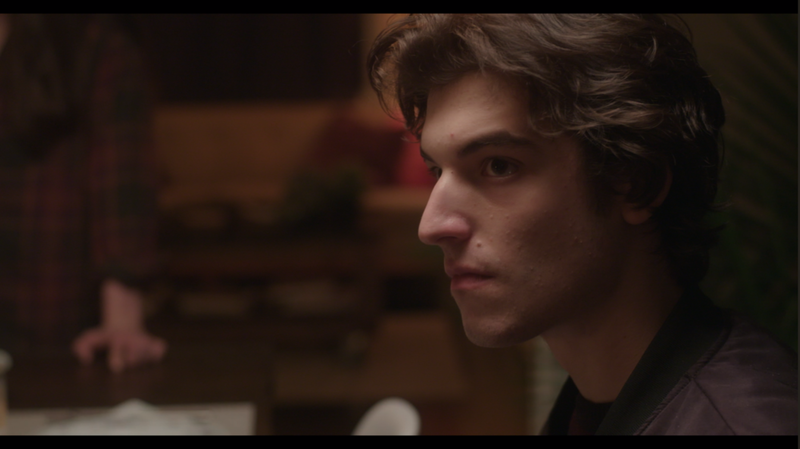 His cinematography earned him acclaim for the short film “Some Monsters,” which premiered at the National Film Festival for Talented Youth (NFFTY) in 2016 and was not only a featured as a centerpiece film, but won Best Narrative Film. Kevin looks forward to expanding his career beyond Pittsburgh and his future as a Director of Photography of music videos, television shows, and feature films.